If you are in Verona, the city of Romeo and Juliette, you should go in Corso Santa Anastasia which runs between the famous Hotel Due Torri and the lively Piazza Erbe. 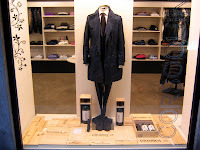 - CORSO 15 for the trendiest man dressing, look for Maurizio. Then you may go for a nice dinner in Lazise, Lake Garda, at Ristorante Alla Grotta (ph. +39 045 7580035). Look for Marco and Roberta.